I’ve often heard the psychological aftermath of a veteran’s military service described as a black dog. The black dog is an emotion, or series of emotions, that the veteran experiences, sometimes under control, sometimes uncontrollably. 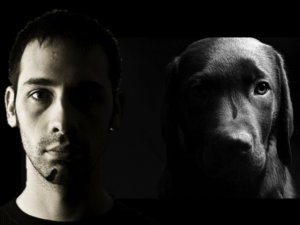 The black dog of PTSD can be terrifying. It’s always on alert, hackles raised, mouth curled in a snarl, as a warning. Warning others not to approach, as danger is near. Warning others to stay away, as they may BE the danger. Snapping, barking, growling, scratching at the ground, prowling back and forth but never taking it’s eyes off of you. And everybody. And everything. The black dog of PTSD has seen things and had to do things that no dog should ever have to see or do, and is constantly on alert as if it were to happen all over again. The black dog of anxiety is pitiful. It’s a dog that has learned that every movement contains danger, and even the slightest gesture can make it flinch. Tail tucked, cowering down, a mere shadow of what it once was. The anxiety dog has been kicked by a cruel master way too often, and looks out at the world with fearful eyes. Like a dog reacting to a thunderstorm, the black dog of a veteran’s anxiety will react to other things: crowds, traffic, uncontrollable situations. The reaction will be similar as well. As a dog is afraid of thunder, and starts to tremble uncontrollably, pacing the room, so too does the anxiety dog. As our dog does, so do we. The black dog of depression sits on the veteran, heavy and immovable. It weighs you down, holds you back, keeps you stuck and stagnant. The depression dog is sometimes a constant companion, always there, always present. It is as common as a shadow, enveloping the veteran, cloaking them. It curls at the veteran’s feet, and in the veteran’s heart, in the morning, follows their footsteps all day, and keeps them companion through the night. The thing about the black dog of the veteran’s emotion: it’s our dog, and we love it. We don’t always enjoy it, we sometimes wish it wasn’t there, but it’s comfortable and familiar. We might accept it as something that will never go away, or we might take it with us wherever we go as a matter of pride. “Of course I have a black dog,” we say when others point it out, “I’m a combat vet, what do you expect?” We even feed the dog, nurture it, allow it to grow more anxious, more depressed, more angry. The other thing about the black dog: it doesn’t have to stay that way. We can learn to control it, to make it less present and impactful on our daily lives. We don’t have to make it go away entirely, as we are never the same once the black dog comes into our lives. Instead, we can train the black dog to be something else. The black dog of PTSD can be tamed. The anxiety dog can be calmed. The black dog of depression can be uplifted. We can learn to understand the warning signs of when the black dog starts to come around, and manage how we react to it. We can understand the things in our environment that will bring out the PTSD dog, or trigger the anxiety dog. We can protect against those thoughts that allow the depression dog to show up. We can also understand that, sometimes, the dog’s gonna get loose and go tearing around the neighborhood. That’s okay. It doesn’t have to be often, and it doesn’t have to be for long. We can learn to control it, manage it, understand it, and be okay with it. We can either resist the dog, be angry at ourselves because we are dragging the dog around with us, and even grow to hate the black dog of our emotion as much as we are comfortable with it. We can do all sorts of unhelpful things to try to get rid of the black dog; we drink. We fight. We give the black dog of our emotion control over our actions, and hurt others. We may even hurt ourselves; because letting the black dog be in control of our lives is easier than trying to control it. It doesn’t have to be that way. We can come to a place of acceptance, of understanding, that the black dog of our emotion is part of us. It’s who we are; it’s what we are now. It’s a matter of becoming aware of the fact that the dog is there, being aware of the impact that it’s having on our life and those around us, and beginning to understand why. Why the dog is there in the first place. Why it sticks around, despite our best efforts to make it go away. Once we become aware, and then understand, then we can choose to change. To tame the black dog. To get it under control. We don’t have to do it alone; there are professionals who can help us calm the black dogs inside of us, just as there are professional trainers who can help train our real pups. You just have to find one who understands the black dog, and the dog’s owner; they’re out there, and while searching may be challenging, it’s ultimately worth it. Learn to control the black dog, don’t let the black dog control you. I think this is a good metaphor for the emotions and thoughts that can run a combat vet’s life…the subtext that mostly no one else sees. I also agree that the first step, is to recognize it as an entity that’s not all of who a combat vet is, or who he or she has to be. We work with this at The Equus Effect. We meet it head on in the form of a curriculum that involves experiential learning with horses and some didactic stuff that helps make distinctions among emotions – fear, vulnerability, anger, frustration, agitation, sadness and grief. It’s good stuff…and helps vets make those shifts so that they can manage that black dog…rather than repressing it or acting it out. Very well done! Where are you, Duane? Thanks for the information, Jane, everything helps. As you said, it starts with awareness! And thanks for the feedback!